Need advice about a specific Jeep Cherokee problem? Chart based on 10 repairs. See TSBs and recalls for the 2016 Jeep Cherokee. Chart based on 8 repair trips. The repair cost chart excludes repairs made under warranty, do-it-yourself repairs, and repair trips that include maintenance. 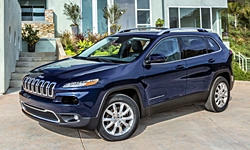 See repairs for all Jeep Cherokee model years. 1240 mi Hood was rubbing on the fenders when it was opened and closed. The dealership re adjusted the hood and squared it up so that it was not rubbing. 14000 mi Front proximity sensors kept seeing things that were not there. Tech made adjustments and reset system. No repair items. 34000 mi Defective cell. Replaced under warranty. 19600 mi Start Stop system inoperable light came on a little while ago, diagnosed as the Battery not giving enough Amps, replaced battery. 5000 mi Drivers side strut and mountbwere broken, right at delivery. 6000 mi Front half shafts needed to be replaced with stepped half shafts due to wobble around 15-20 MPH while shifting into second gear. 26300 mi Recall on loose wiper arms Backup camera not working. Replaced it. See our lemon odds and nada odds page to see vehicles with no repairs or vehicles with more than three repairs. To see how frequently 2016 Jeep Cherokee problems occur, check out our car reliability stats.